Tesla turning to Chinese supplier for batteries to be used in new Chinese assembly plant. Toyota will use the batteries produced with Panasonic for vehicles manufactured at its joint facility with Mazda. Toyota Motor Corp. will set up a new joint venture with Panasonic Corp. to develop and produce batteries that could be used in the new electric vehicles the Japanese automaker is developing. Panasonic is one of the industry giants when it comes to producing lithium-ion batteries and has been a key partner of Tesla, investing billions in the U.S. automaker’s Gigafactory battery plant in Nevada. Tesla, meanwhile, is reportedly locking down a new deal with China’s Lishen to supply batteries for the Shanghai assembly plant it is currently building. “Today’s automotive world is also being called on by society to help find solutions to such issues as those related to global warming, resources and energy,” Toyota and Panasonic said in a statement. Toyota will hold a controlling, 51% stake in the new joint venture, Panasonic the remaining 49%. The two partners did not disclose how much they will invest but said they plan to have the operation up-and-running by late 2020. It will eventually employ 3,500 workers. The project is meant to not only produce new lithium-ion batteries, but also focus on the development of next-generation technologies. Toyota was a pioneer in the launch of hybrid-electric vehicles, its Prius model the world’s first HEV. But while it has long relied on older nickel-metal hydride batteries, the automaker was long reluctant to shift to the lithium technology needed for more advanced plug-in and pure battery-electric vehicles, or BEVs. It has only recently begun using lithium-ion cells in the plug-in version of the Prius. That is expected to change once Toyota rolls out new, longer-range plug-based models, including the ones it will assemble at a new factory going up in Alabama, the heart of a new joint venture with Mazda Motors. 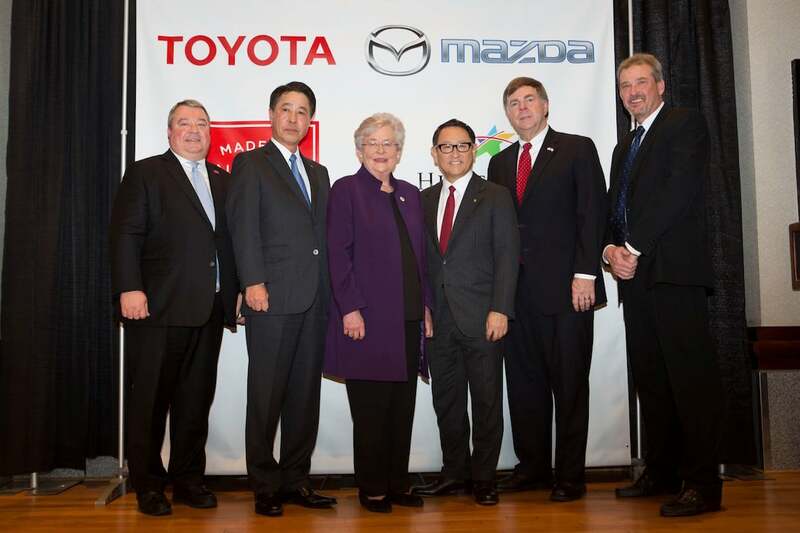 But Toyota officials have also indicated a desire to shift to next-generation solid-state batteries for the Alabama project, and part of the new joint venture with Panasonic will see the partners cooperate on the development of that technology. Solid-state batteries eliminate the liquid gel used in current lithium cells, reducing the risk of fire while also addressing other problems with current battery technologies. Also known as lithium-air, the new approach is expected to yield smaller, higher-density batteries that also can charge faster. And they are expected to cost less than lithium cells, helping manufacturers achieve the holy grail of delivering electric vehicles that have long range, fast charging and a cost comparable to vehicles using gas or diesel engines. But, to date, solid-state batteries have only been used in the lab. Experts disagree over the pace of commercialization. Some contend the technology could be ready before mid-decade, others contending it won’t be ready until around 2030, if ever. The Toyota-Panasonic deal shows that there are few monogamous relationships in the battery-electric world. Panasonic, one of the world’s largest EV battery suppliers has had an ongoing partnership with Tesla, investing heavily in the Reno, Nevada Gigafactory. Tesla is looking at a new partner of its own for its Shanghai manufacturing operation. While it is in talks with China’s Lishen, however, it issued an advisory that a deal is not yet in place. This entry was posted on Tuesday, January 22nd, 2019 at and is filed under Automakers, Automobiles, Business, EVs, Electrified Vehicles, Executives, Markets, Personalities, Technology, Toyota, U.S./North America. You can follow any responses to this entry through the RSS 2.0 feed. Both comments and pings are currently closed.